Temporary tattoos come in a number of different forms, the most common being those that are applied to the skin with a bit of water. Once applied, the temporary tattoo will stay in place for a few days and can be removed with just a small amount of baby oil. When you choose to buy temporary tattoos online, you will find that they come in stock designs as well as custom designs. This means you can choose tattoos that have already been printed, or you can choose tattoos that you design yourself. Temporary tattoos are typically very affordable, are safe for the skin and with so many options, you can easily find the right tattoo design for you without making any permanent mistake. Temporary tattoos are inexpensive - Typically, you will find that temporary tattoos are only a couple of dollars each, sometimes even less. Even custom designs are quite affordable giving you a great way to express your pride, your personality or even your opinions. Temporary tattoos are safe - as long as you choose a site that offers tattoos that comply with FDA guidelines, and all of the sites listed here do, there is no reason to believe that temporary tattoos are unsafe in any way. Temporary tattoos are not permanent - Since these tattoos only last a few days, they are an ideal option for those who are looking for a tattoo for a specific event or for a specific time span. They are also great for those who are considering a permanent tattoo and want to see how it will look. Who Should Use Temporary Tattoos? Almost anyone can use a temporary tattoo. They are great for kids and adults, and can be a very fun way to make a statement. Kids love them, especially when they feature their favorite things, like animals and cartoon characters. Adults love them too, thanks to their versatility and the fact that they can remove them. People who are considering a permanent tattoo will also love temporary tattoos as it will give them a great way to see how their permanent one will look. Where Can I Buy Temporary Tattoos? There are a number of excellent Internet sites that offer both temporary and custom temporary tattoo options. You can learn more about these sites and what they offer by reading our reviews of each. The site Tattoosales.com is a popular website where you can find hundreds of printed temporary tattoos as well as the ability to custom design tattoos. The company has been around for more than 25 years and offers both free shipping and a 5-day turnaround on custom temporary tattoos. This site offers an outstanding collection of pre-printed temporary tattoos including glitter tattoos, glow in the dark tattoos, wounds and scars for Halloween and even character tattoos like "Hello Kitty." 100s of temporary tattoos are available on the site for order. You can also choose custom tattoos based on your own design, logo and size. The company offers temporary tattoos that are completely safe and exceed FDA standards for cosmetics. Tattoosales.com offers a number of free perks to their customers including email proofs on custom orders, your choice of ink, free shipping on orders over $15, and free cutting on temporary tattoos. Though the majority of customers have no complaints about this company, there have been reports of missing tattoos in orders. The company, however, seems to take the right steps to remedy the issue. There are reports from customers about slow shipping times, though most seem to have received their shipments as promised by the company. If you are considering ordering a temporary tattoo, Tattoosales.com is a top choice. They have a huge selection of items, they offer custom tattoos for any occasion and a 100% satisfaction guarantee. The site StickerYou.com is not a typical site for temporary tattoos, however, you can certainly buy them on this site. This site offers marketing materials for businesses, organizations and even individuals, including temporary tattoos. The temporary tattoos are sold by the sheet, not the single tattoo, and you can customize the design you want through the website. These tattoos are safe, FDA approved and they last for an average of 3 days. The temporary tattoos from StickerYou.com come on a sheet and are available in any shape and size as long as it can fit on the sheet. The site offers custom options only, but you can use a template to help you through the design process. They offer some design options for tattoos, or you can upload your own images to the site and build your temporary tattoo from scratch. 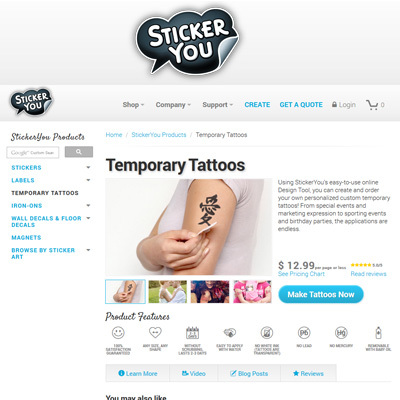 Since StickerYou.com offers more than temporary tattoos, you won't get the expertise like you might when you order from a site devoted to these products. Some reviewers of the site have had difficulties with the quality of the merchandise from this site as well as with shipping speeds. StickerYou.com isn't a traditional site for temporary tattoos, but if you are seeking out a custom option for your business, organization or event, it is recommended that you take a look. The main reason that Tattooforaweek.com stands out from the crowd is because they offer more than 3500 different tattoo designs. You will have no problem finding the perfect tattoo for your needs when shopping on this site. The temporary tattoos you will find on this site are FDA approved, they ship worldwide and will do custom tattoos for organizations and events. You can find all different styles and types of temporary tattoos from Tattooforaweek.com including styles that come from your favorite tatted up celebrities. The options available from Tatooforaweek.com are so large there is absolutely no reason you would ever not find the design you are looking for. They offer shipping within 24 hours of your order which ensures you get your temporary tattoo quickly. You can buy individual tattoos from the site or you can purchase sets of tattoos. You cannot get free shipping on the site unless you buy a certain amount from Tattooforaweek.com, $20 in the US. Though the company offers custom orders, you will need to buy a minimum of 1000 tattoos, which will be too many for some customers. With the amazing selection, worldwide shipping and the ability to choose from individual tattoos or sets, you will certainly have no issues when shopping at Tattooforaweek.com. Tattify is a well known temporary tattoo shop that sells their products through their traditional site and through the online site, Etsy. This makes them a bit different than the other companies on this list. Just because they sell through another site, however, doesn't mean that they aren't offering high quality products. Instead, it's like buying from a small business instead of a well known corporation. You can still find the tattoos that you are looking for, either in the form of individual tattoos or sets. The site has more than 700 different design options, so you are almost guaranteed to find exactly what you are looking for when shopping at Tattify. The temporary tattoos are high quality, they last for several days and shipping is very fast. According to user reviews, some of the colored tattoos available on the site look fake. This is problematic since most people want to show the illusion that the tattoo is real. The all black tattoos don't tend to have this issue. With so many design options, fast shipping and the ability to get custom tattoo options, you will find Tattify can easily meet your needs. When it comes to a great deal on tattoos, Fickletattoos.com can easily offer one. This is a site based in London and offers all of their tattoos two for £5 or collections that are five for £15. 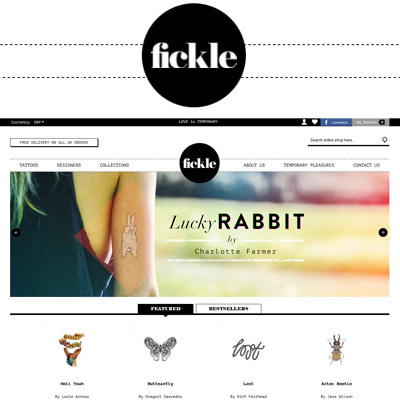 The thing that makes Fickletattoos.com stand out from all of the others is that they forego the typical temporary tattoos that you find on other sites, like well-known cartoon characters. Instead, the company hires designers from across Europe to design unique temporary tattoos that you won't find anywhere else. 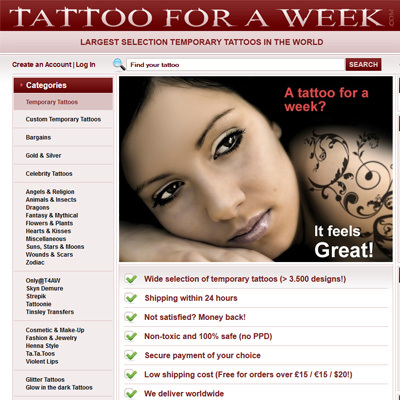 The site offers designer tattoos that are unique and rare. They always hire on new designers, too, so there is always something new. The temporary tattoos will last from two to seven days depending on how well the tattoo is applied and where the tattoo is placed. The temporary tattoos available from Fickletattoos.com are not custom made. Though they are unique, designer tattoos, you cannot get custom designs. Though they offer free shipping to the UK, if you order these tattoos from the US or another country, you will need to pay international shipping rates. There are a lot of good reasons to shop for tattoos online at Fickletattoos.com, especially if you are looking for something unique. They also do a great job at giving customers a lot of options. The site MyTaT.com is a run of the mill temporary tattoo website that offers a number of temporary tattoos and collections of temporary tattoos to their customers. Each temporary tattoo you buy from the site comes in a two-pack, though they also offer sets which contain 6 to 40 different tattoos in each collection. In addition to offering the temporary tattoos on their site, MyTaT.com also can custom design tattoos for your event or for your organization. The ability for customers to choose either individual designs or sets of temporary tattoos in certain themes. Customers can reach out to the company and order custom designs based on their individual needs. Free shipping on all orders throughout the United States, though there is a flat $3.00 shipping fee for international customers. 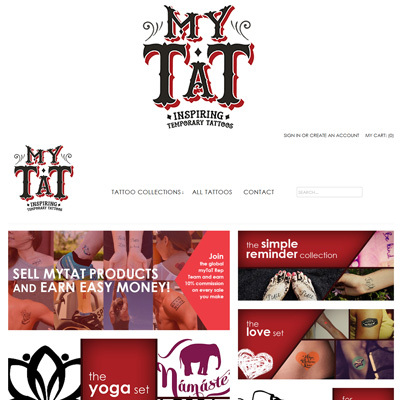 MyTaT.com doesn't have a huge selection when it comes to the designs you will find on this site when compared to others. Though other sites report that their temporary tattoos will last for up to seven days, this site claims their tattoos will only last from two to three days. If you are looking for something simple and popular, MyTaT.com is a great choice when it comes to temporary tattoos. Though they don't have a large selection, for many people, the tattoos on this site will effectively meet their needs. The site Flashtat.com is a bit different from other temporary tattoo sites simply because they offer something a bit different. Instead of offering their customers a traditional offering of whimsical, colorful tattoos that most sites offer, Flashtat.com tattoos are a mixture of temporary tattoos and jewelry. So, instead of buying a new necklace for a night out, you can easily just buy a temporary tattoo from this site that looks like a necklace. There are a number of collections to choose from and all are gorgeous. 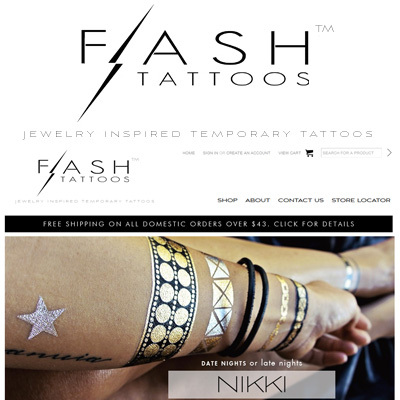 Flashtat.com brings customers something new and different with their products, temporary tattoos that double as jewelry. There are a number of collections to choose from, all with different looks and styles from the casual and traditional to the flashy and contemporary. The site offers sheets of tattoos that allows your creative side to come out no matter if you want to design your own anklet or your own pendant necklace out of temporary tattoos. As with all companies, though Flashtat.com is a great company, there are some considerations you will want to keep in mind. If you are looking to make an impression with temporary tattoos, you certainly will not go wrong when choosing to order from Flashtat.com. If you are looking for custom temporary tattoos, you can find them on Brandnex.com. This site is not a traditional seller of temporary tattoos, instead they sell promotional products including temporary tattoos. Brandnex.com focuses on providing these temporary tattoos to businesses and organizations who are looking to use their own logo, message and information on the tattoos they hand out to clients, customers and supporters. Custom tattoos in any size you wish to order from 1.5" x 1.5" to 4" x 6". This ensures that you find the right size for your organizations message. With each order of custom temporary tattoos, you will get free shipping, an additional 100 tattoos for no extra charge and a guarantee that they have the lowest price. If you find a lower price on the same item, your order is free. The site offers tools to help with your custom design like a color chart, templates, clip art and fonts. 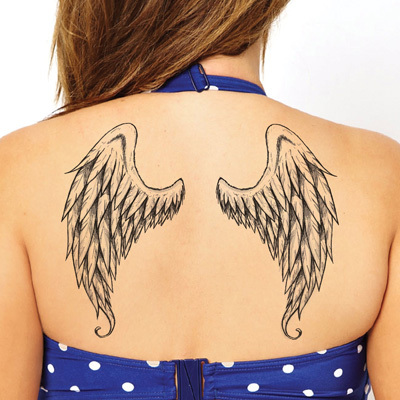 This site sells many types of bulk branding products, so most of the time, these temporary tattoos will only be appropriate for businesses or organizations that are ordering large quantities. You can only order custom tattoos from this site. Pre-printed tattoos are not available. For those who are looking for a solution when it comes to bulk, custom temporary tattoos, Brandnex.com is a great option. Others, however, should probably choose another site. TattooFun.com has been offering temporary tattoos to their customers for over 15 years and they still offer the high quality products today that they started offering in 1998. You can order pre-printed temporary tattoos from TattooFun.com, or you can choose to order custom tattoos for your event, organization or business. In addition to selling temporary tattoos, you will also find that the site sells pre-printed and custom stickers. TattooFun.com has hundreds of pre-printed tattoos in stock as well as the ability to do custom tattoos. No matter what you are looking for, you will find the temporary tattoos you need on this site. The site offers very fast shipping on both in-stock and custom tattoo, sometimes in a day. TattooFun.com gives customers a satisfaction guarantee and their temporary tattoos are FDA approved. The site does not offer free shipping like other sites unless you spend a minimum of $50. Since their individual tattoos range from $3 to $5 a piece, typically only those who order in bulk will get free shipping. There are some possible fees associated with their custom tattoo service such as a set-up fee for printing on the tattoo sheet. These fees are in addition to the price of the tattoo sheet. TattooFun.com is one of the big players in the temporary tattoo industry and you can feel confident shopping through their website. 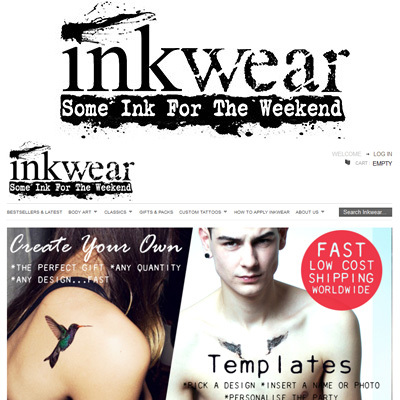 Based out of the UK, Inkwear.co.uk is a trendy, edgy choice for those who are looking for temporary tattoos. They have a lot of products that are different than the typical temporary tattoo such as arm sleeves and faux jewelry. In addition to the traditional temporary tattoos that most of these sites sell, Inkwear.co.uk also offers custom temporary tattoos, celebrity-based temporary tattoos and sets of temporary tattoos. Inkwear.co.uk offers a number of unusual tattoos that are funky and modern. Many of these designs cannot be found anywhere else. Like a tattoo that your favorite celebrity has? You can have your own temporary version when shopping at Inkwear.co.uk. Some celebs that are featured include Rhianna, Angelina Jolie and Cheryl Cole. The temporary tattoos you buy from Inkwear.co.uk will last for up to five days which is longer than other temporary ink on the market. Inkwear.co.uk does not offer free shipping like other sites. Shipping to the US typically costs a couple of dollars which makes ordering from this site a bit more expensive than ordering from others. Some customers have reported that there is a gel-like substance that is left behind after they apply the tattoos from Inkwear.co.uk. Though it can be wiped away, other companies don't seem to have this issue with their tattoos. 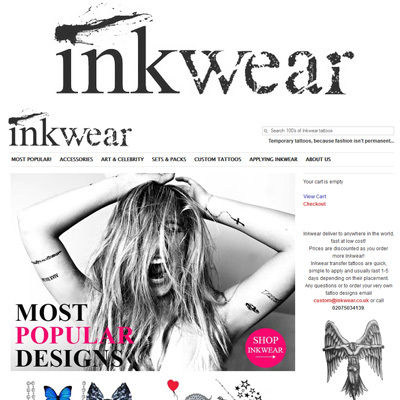 If you are looking for a bold temporary tattoo, Inkwear.co.uk is a great option thanks to their great selection. Inkweartattoos.com is the US version of the UK site. Though they are the same company, you will find that there are a few different options on each site, so it is recommended that you check both of them out if you are looking for a temporary tattoo. Just as the UK site, you will find a number of unusual, yet trendy options when it comes to temporary tattoos on this site including full tattoo sleeves and temporary tattoos that look like jewelry. You will also find that you can get custom tattoos through Inkweartattoos.com. You will find a number of new designs on the site that other companies don't offer. This company really does pave the way in many cases when it comes to temporary tattoos. If designing a custom tattoo, the site provides templates, designer advice and even the ability to put pictures on them. Inkweartattoos.com offers traditional temporary tattoos, temporary nylon tattoo sleeves and nail tattoos. The site does not offer free shipping and if you order from the site, your tattoos will be shipped from the UK. This will cost a bit more and take a bit longer. The designs that Inkweartattoos.com offers on their site can disappear quickly as new designs are brought in. If you find a design you like, this means you may lose it if you don't buy several. 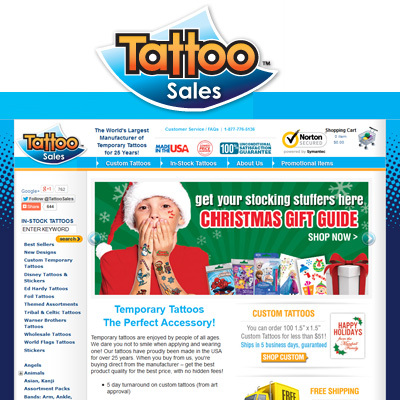 When it comes to temporary tattoos, you won't go wrong by choosing Inkweartattoos.com and can shop with confidence. 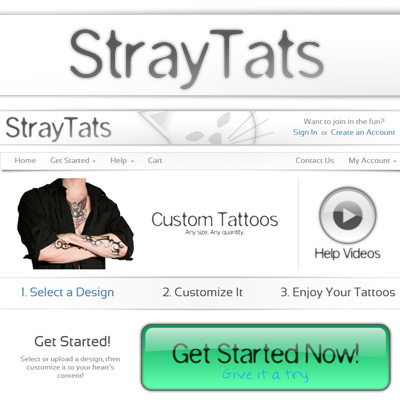 StrayTats.com is a temporary tattoo site that is a bit different from the others online. You will not find hundreds of options, you won't find your favorite phrases or cartoon characters, nor will you find any pre-printed temporary tattoos. Instead, when you shop at StrayTats.com, you will find a number of basic designs that you can fully customize it to make it your own. This helps you design temporary tattoos that are uniquely your own. When you buy temporary tattoos from StrayTats.com, you can design your own, unique tattoo that perfectly meets your needs and expresses your personality. You can use their own designs or you can upload your own design or photo and turn it into a temporary tattoo. You can get your temporary tattoo in any size from a 1"x1" square to a 7.5"x10" sheet. The temporary tattoos available from StrayTats.com are all customized. This means ordering can take awhile and you will need to be a bit creative. When shopping at StrayTats.com, you will likely notice that these tattoos are a bit more expensive than tattoos you will buy from other sites. This is due to the customization process. For most people, making the choice to stop at StrayTats.com is a good one, especially if you are interested in custom temporary tattoos. Those who need tattoos quickly, however, may want to choose another site. The website Tattly.com has a nice selection of temporary tattoos that design-wise, really stand out from the crowd. Though you cannot design your own tattoos on Tattly.com, all of the temporary tattoos that you find on the site has been created by professional designers. The company sells individual tattoos, which come in sets of two, or you can choose from a number of sets which feature groups of tattoo options that are themed like the floral collection, the New York collection or the Kids Mix. There are over 500 different designer temporary tattoos to choose from, giving you an outstanding chance of finding exactly what you are looking for. All of the tattoos from Tattly.com come with a spare, so you get two for the price of one. Shipping is free to the US when you buy from Tattly.com, but there is a fee for international shipping. Though Tattly.com offers some custom designs, they will not design a temporary tattoo from scratch. At best, they will offer feedback on designs sent in by their customers. Tattly.com temporary tattoos seem to be on the more expensive side of the spectrum. Keep in mind, however, you do get two tattoos when you order a design. Tattly.com offers cool, trendy designs for those seeking out a temporary tattoo. 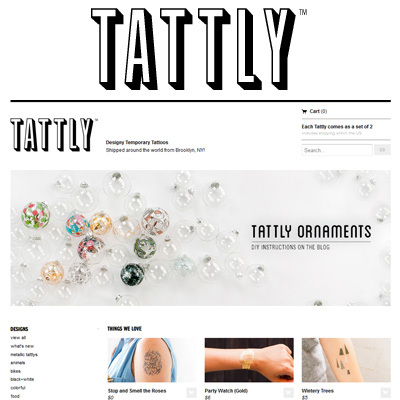 Since they have so many designs available on their site, you will likely find exactly what you need from Tattly. FakeTattoos.se is really no different than any other temporary tattoo site out there, and you certainly will find the type of tattoos you are looking for quite easily. The site offers temporary tattoos for your body as well as for your nails. In addition to their printed tattoos, you can also contact the site for custom designed temporary tattoos. The site is constantly adding new designs to their inventory and they ship their tattoos worldwide. The site offers free international shipping, so wherever you are, you won't have to pay any shipping or handling costs. You will find a number of stock tattoos available at FakeTattoos.se, but you will also find custom designs which are ideal for companies or organizations interested in featuring their own logo and information. The company offers a number of discounts and sales for customers. The site FakeTattoos.se is based in Sweden. Though the shipping is free, it can take longer for your tattoos to arrive. Reviewers state that though the temporary tattoos are high quality, they seem to be smaller than the photos on the website indicate. Choosing to buy your temporary tattoos from FakeTattooos.se is a great option and you can feel confident that any tattoo you buy from this company will be high quality and last for several days. The site TattYoo.com has a number of very cool tattoo designs, both in black and in color. Though the company has only been around for a couple of years, they have already made a name for themselves in the industry. Choosing to offer both stock tattoos as well as custom designs, the company ensures that they can provide the temporary tattoos that most people want. What sets this company apart from the others is that they tend to focus more on themes, and are a great choice for those looking for tattoos for parties and events. The site offers a number of temporary tattoos for kids, many for adults and excellent choices for events like weddings. You can contact the company to make custom tattoos featuring your own design or tell them what you want and they will make the tattoo of your dreams. 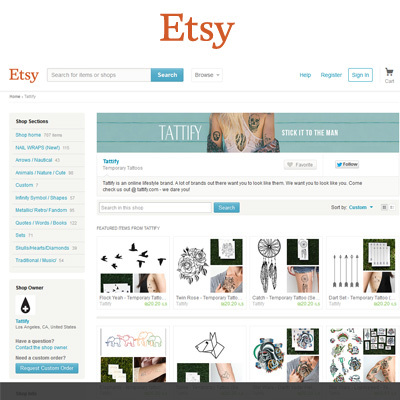 The tattoos you buy from TattYoo.com are more expensive than other temporary tattoos. However, they are marketed as luxury tattoos and are very high quality. The company does not offer free shipping unless you spend a certain amount of money, essentially, the equivalent of 4-5 temporary tattoos. TattYoo.com is a solid choice when you are looking for high quality temporary tattoos and buyers can feel confident that they are getting a great value for their money. When it comes to trendy designer temporary tattoos, you will find that Youngandsmitten.com is an excellent choice. Most of the temporary tattoos you will find on the site are quite simple, most of them made with black ink, though some have a splash of color. You will also find a number of unusual tattoos, like those that can be placed on the tip of your fingers or those that fit nicely on your wrist. Most of them are small, too, which give the perfect accent to your body. The site offers free shipping, anywhere in the world, regardless of how much you spend on the site. In addition to the individual temporary tattoos that are featured on the site, you will also find that Youngandsmitten.com offers sets including sets for kids and for adults. Each tattoo you buy from Youngandsmitten.com comes in a set of two. The temporary tattoos from Youngandsmitten.com ship from the UK, so if you are ordering from the US, it will take a couple more days for shipping. The company does not offer custom designs at this time, but they have a very nice selection of pre-printed temporary tattoos. 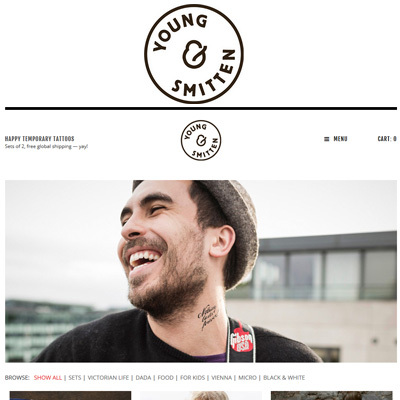 You will find that Youngandsmitten.com is a great site to shop on when looking for temporary tattoos, especially if you are looking for unique designs.